The 2007 Chrysler Aspen is a big, traditional sport utility. Representing a new nameplate, the Aspen is a full-size SUV based on the Dodge Durango. Aspen shares Durango's size and mechanicals; the main differences being styling, interior and tuning. Both use truck chassis and engineering. So the Aspen offers the advantages of a cavernous interior and the ability to tow moderate trailer loads. It's in the same class as the Chevy Tahoe, GMC Yukon, and Ford Expedition. Aspen is an attractive package with a competitive line of engines, including a 235-horsepower, flex-fuel V8 that runs on either regular gasoline or E85 (a blend of 15 percent gasoline and 85 percent ethanol) and a 335-hp, 5.7-liter V8 with a system that conserves fuel by shutting off half the cylinders when the engine is running under a light load. Buyers can choose between rear-wheel drive and four-wheel drive with either engine. Styling is pure Chrysler, with a traditional-but-subdued, egg-crate grille; mildly curvaceous bodylines vaguely reminiscent of the smaller, but genetically related Durango; and an attractively sculpted tailgate. Tires and wheels properly fill wheel wells, with good-looking, 20-inch, chrome rims adding bling to the uplevel model. Aspen accommodates six, seven or eight passengers, depending on seat configuration. Three rows of seats are standard, starting with front buckets, a second-row bench and a third-row bench. Buckets are optional for the second row. The interior blends elegant-looking, satin-finish metallic accents with wood-grain trim on the dash and center console. Standard upholstery is Chrysler's trademarked fabric that resists stains and odors. The requisite leather trim that's standard on the up-level Aspen is optional on the base model. All the usual power and personalization features are available. Once past the initial impression, signs of cost cutting, inattention to detail or both begin to emerge, however. Interior finishes look better and more expensive than they feel. Stylists, or the people who pay their bills, seem to have scrimped on such subtle things as thickness of padding on armrests and bin covers. A few critical ergonomic decisions, too, show an imbalance between looks and function. For example, that the steering wheel, a luxurious-looking combination of woodgrain and leather, comes standard with a tilt adjustment is appreciated. And that power adjustable pedals are offered as an option is also a plus. Only problem is, with the standard, fixed pedals, it's difficult if not impossible for short-stature drivers to position the seat where they can reach the pedals and still maintain the 10-inch safety zone drivers that should maintain between their upper body and the steering wheel's airbag. Optional power-adjustable pedals are designed to address this. The Aspen receives better and more consistent marks on the technology front. Both powertrains earn decent fuel economy ratings by the federal government, either matching the competition or at worst giving up no more than one or two miles per gallon, even in the new, revised system the EPA will use for the 2008 model year. And the Aspen's standard electronic stability control system incorporates a new and so far exclusive feature that controls the dreaded and eerily destabilizing trailer sway. 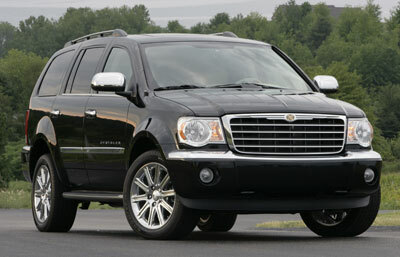 The Chrysler Aspen 4X2 ($30,745) and 4X4 ($33,520) come standard with the 4.7-liter V8. Standard features include Yes anti-stain and odor-resistant fabric upholstery; air conditioning, cruise control, AM/FM/CD stereo with four speakers and steering wheel-mounted audio controls; power windows, heated-and-fold-away outside mirrors and keyless-remote central locking; tilt steering wheel; eight-way power driver's seat (with manual lumbar); 40/20/40 second-row seats; third-row seat; Vehicle Information Center with compass heading, ambient temperature, trip computer readouts, tire pressure warning and driver personalization settings; programmable, universal garage/gate remote; 115-volt auxiliary power outlet; Interior Convenience Group with overhead console, illuminated visor mirrors, automatic headlamps, rear seat courtesy/reading lamps and front center console floodlamp; fog lamps; and P265/60R18 on-/off-road tires on aluminum wheels. Options start with the 5.7-liter V8 ($995). When the 5.7-liter engine is ordered with the 4X4 ($1,190), the single-speed transfer case is standard (accounting for the price difference), the two-speed transfer case is optional ($195). The stereo can be upgraded with eight Alpine speakers accompanied by a 276-watt amplifier ($395) and an in-dash, six-disc CD/MP3 changer ($300). Other audio-electronic options consist of a DVD-based, GPS navigation system with a six-disc changer ($1,595); a rear-seat entertainment system with wireless headphones ($1,200); Sirius satellite radio ($195), including a one-year subscription; and Chrysler's UConnect Hands-Free Communication system, with Bluetooth capability and auto-dim rearview mirror ($360). Other options include leather-trimmed front bucket and second-row, folding bench seats ($905); leather-trimmed, second-row bucket seats ($700); heated front seats ($250); heated second-row seats ($250); three-passenger, 60/40 split, third-row seat ($300); power adjustable pedals ($120); a Power Convenience Group comprising rear park assist and power liftgate ($655); power sunroof ($850); laminated front and rear door glass ($300); and front and rear floor mats ($30). On the hardware side are a trailer-tow group, with seven and four pin pre-wiring, transmission cooler, heavy duty engine cooling, power steering cooler, Class IV hitch, 160-amp alternator and 750 cold cranking amp battery ($455); engine block heater ($35); a low, 3.92 rear axle ratio ($40); accent-color running boards ($445); remote start ($185); and on the 4X4 a skid plate group, with tow hooks and plates for the fuel tank and transfer case ($170). Limited 4X2 ($37,190) and 4X4 ($38,510) come standard with the 5.7-liter V8. The single-speed transfer case is standard on the 4×4, the two-speed case not offered. Other upgrades include dual-zone, automatic climate control; the leather-trimmed front bucket and second-row, reclining bench seats; the heated front seats; two memory settings for the outside mirrors, power adjustable pedals, eight-way power driver's seat, audio and climate control; a four-way power front passenger seat; the 60/40-split, third-row seat; the Alpine speakers with amp; the in-dash CD/MP3 changer; the one-year Sirius service; the Power Convenience Group; the accent-color running boards; the floor mats; the laminated door glass; and P265/50R20 BSW all-season tires on chrome-clad aluminum wheels with locking lug nuts. Beyond these upgrades, the same options are offered as on the base model, including the navigation system ($1,295). The Chrysler Aspen looks like a lot of other full-size SUVs, but we found it attracted admiring looks and inquiries. Chrysler styling cues set the Aspen apart from its sibling, the Dodge Durango. The grille, with bold crossbars and classic Chrysler medallion, attempts to stake a claim for the Aspen at the top of the brand's pyramid. Strangely un-prepossessing, low-key headlamp units diminish the claim, which isn't helped either by the bland bumper and generic fog lamps. Embossed strakes in the hood running back to the windshield carry on the newest Chrysler-brand styling motif, seemingly inspired by the jewel-like cap on the famous Chrysler Building in New York City and appearing first on the Crossfire then on the new Sebring. The side view is an uninspired take on standard SUV proportions and features. This isn't to bad mouth the Aspen's styling, only to recognize the difficulty in finding a new, fresh presentation of a look that's been around for, well, more than half a century. After all, what is an SUV but a closed-in, short-bed pickup with four doors? Full-round door handles make for ease of use in bad weather and are kind to fingernails. The swept-back windshield looks sleek and shows homage to aerodynamics. The optional running boards do a better job of dirtying the backsides of trouser legs and long skirts than serving as truly functional steps. Mildly creased, visually pleasant blisters circle the wheel wells. A chrome-topped, overstated molding strip pulls double duty, breaking up the expanse of metal between the front and rear wheel wells while insulating the doors against parking lot dings. Side mirrors proudly perch on brackets extending from the base of the A-pillars (the side frames of the windshield). A slight ridge defining the beltline (where the side windows meet the lower body panels) extends beyond the base of the D-pillar, accenting the graceful outline of the rear quarter window. A short front overhang and tucked-up lower hindquarters invite thoughts of venturing off the highway to explore an unpaved track on the occasional weekend outing. It's the rear aspect of the Aspen that has the most presence, the view most will have of it in traffic. A strong rear bumper with a deep, non-skid clad step cups the one-piece liftgate. Chrome-like trim on the bumper's end caps tie into the side molding strip. The medallion-and-wing treatment from the grille repeats above the stylized license plate recess. Gently bowed sides and rounded top give the back end a smaller, less massive look than the rest of the vehicle. A conservatively sized notch centered in the bumper's lower edge makes room for the optional hitch receiver and junction box. On first impression, the interior looks classy in its material selection, presentation and packaging. On closer examination, however, and after some quality time spent experiencing its quirks and nuances, some of that initial luster fades. The satin-finish metal accents and wood-like trim give the interior an elegant touch, as does the silver-ringed, old-fashioned style clock tucked into a recess in the top-center of the dash. The woodgrain looks better than it feels, however, as do the expanses of textured plastic panels, which are hard to the touch and replete with seams that pose threats of squeaks and buzzes as the miles rack up. Where there's padding, it's noticeably thin. The symmetry of shapes and simplicity of features and controls for stereo, air conditioning and navigation system are pluses that partially counter some of the questionable elements. Front seats are supportive, with adequate bottom and side bolsters for the Aspen's intended use. The fabric upholstery is more comfortable than the somewhat stiff leather. The pivot point for the front seatbacks' recline is positioned above the seat bottom, much like the seats on those regional commuter jets, where to recline in the seat requires sliding one's posterior forward on the bottom cushion, which effectively shortens the seat bottom and reduces thigh support. The laid-back windshield pushes the dash and with it the steering wheel close enough to the driver that the adjustable pedals are strongly recommended to permit a short-stature driver to sit far enough from the steering wheel to maintain the minimum, safety-related, recommended distance between the driver's chest and the steering wheel airbag. And the dead pedal against which drivers might want to brace their left foot while navigating sharp turns is somewhere up near the front bumper and useless for anybody not as tall as, say, Lebron James. The low roofline limits visibility from the inside. The tinted rear glass enhances the image on the rear-seat entertainment system's drop-down video screen, but limits the driver's view somewhat. When deployed, the rear-seat video screen reduces visibility through the rearview mirror. The steering wheel and gas pedal transmit an irritating buzz to the driver's hands and right foot. Something in the underpinnings sends vibrations up through the floor. And at any setting above the lowest, the air conditioning fan emits a coarse noise that gnaws at the edges of the stereo's otherwise quite impressive sounds. Second-row legroom is limited and trails the competition (Ford Expedition, Chevy Tahoe, GMC Yukon, Nissan Armada, Toyota Sequoia) by one to four inches. Knee room for back-seat riders is cramped when the front seat is comfortably positioned for a 6-foot driver. Getting in and out of the second row is easy. The back doors swing open a welcoming 84 degrees and leave space enough in their lower reaches for all but NBA-size shoes. The third-row seats compare well with the competition. The flop-and-flip second-row seats make access to the third row easy. In headroom, the Aspen's back row tops all but the Sequoia. Its legroom handily bests all but the Expedition. Hiproom and foot room in the third row is relatively tight, however, especially in the center position, the automotive equivalent to the center seat in the back of a plane. Cargo space is aplenty. With the third row folded, the Aspen's 68.4 cu. ft. of cargo tops the competition. Fold and flip everything behind the front seat and the Aspen's 102.4 cu. ft. is average when compared with the other full-size SUVs. The Chrysler Aspen rewards the driver with hearty mechanical sounds from the engine compartment, prompt throttle response, solid gear shifts and thoroughly competent brakes. Ride and handling attributes are more mediocre than marvelous, however. The reason: It's tall, heavy and narrow. The ride tends to the springy end of the scale, and the Aspen loses composure around curves. The up-level Aspen's 20-inch wheels with fatter tires stick better than the base model's taller tires and 18-inch wheels at the price of a slightly harsher, but no less bouncy ride. The top-level engine, the vaunted, 5.7-liter Hemi, runs out of breath on the far side of 80 miles per hour. However, the torque rating promises it can pull a four-ton-plus trailer. If towing is not a required use, the 4.7-liter V8 is the preferred choice, and made even more attractive by the availability of the two-speed transfer case. Towing trailers long distances should be eased by a promising new feature Chrysler calls Trailer Sway Control. This system senses trailer sway and employs the electronic stability control to apply tiny amounts of brake pressure selectively to individual wheels and to reduce engine torque to counter trailer-induced yaw. We haven't hooked a trailer to an Aspen, but the concept is logical and impressive and we'd assume it works as intended. As for fuel efficiency, the Aspen is equal to the competition. The 2007 Chrysler Aspen is a competent full-size SUV that offers the hauling and towing capability of a truck. In snapshot comparisons with the competition, the Expedition feels roomier, the Tahoe/Yukon rides and handles better, the Armada feels, and is, heavier, and the Sequoia feels better put together. NewCarTestDrive.com correspondent Tom Lankard filed this report from Palm Springs, California. Head/hip/leg room, f: 40.8/58.8/41.4 in. Head/hip/leg room, m: 39.3/57.2/37.4 in. Head/hip/leg room, r: 39.2/48/34.5 in. Cargo volume: 102.4 cu. ft.